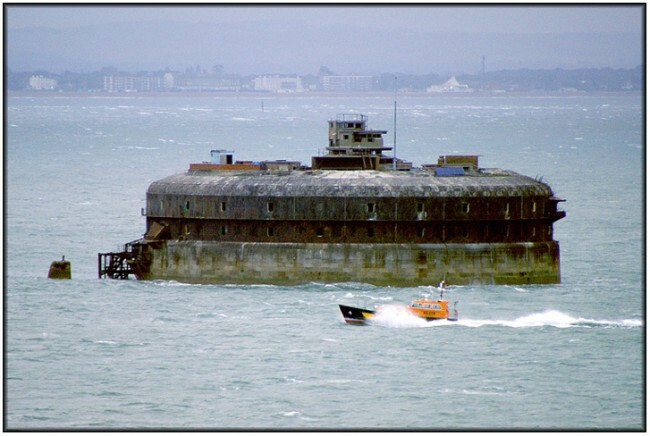 This is Horse Sand Fort which is one of four built as the outer line of sea defences intended to protect the Spithead anchorage and the approaches to the Solent and Portsmouth from French invasion. The forts were built on the recommendation of a Royal Commission report entitled “Report of the Committee Appointed to Enquire into the Construction, Condition and Cost of Fortifications Erected in 30, 31 Victoria and Previous Statutes, Together with minutes of Evidence”, published in 1859. The name “Palmerston Forts” comes from the name of the then Prime Minister, Henry John Temple, 3rd Viscount Palmerston. Horse Sand Fort was built between 1865 and 1880. It is built on a circular plan and is 240 ft in diameter, consisting of two “gun decks” or floors and a basement and is fully armour plated. Originally it was intended that the armament should consist of 45 x 10" and 44 x 12.5" rifled muzzle-loading (RML) guns on the gun floors and 10 x 12" RML guns mounted in five turrets on the roof. In the event, the roof turrets were never installed and restricted space on the gun floors meant that the 12.5” guns had to operated with reduced charges. In the end, in 1882, some of the 12.5” guns were replaced with 12”. None that of that has any apparent connection with lighthouses, but the fort is, in effect, an active lighthouse although the light is very much of the bulb on a stick variety. It can be clearly seen in this photograph just to the right of the former fire control building on the top of the fort.